Good morning! Welcome to my web site, where you can find out about my music, and listen to some of it, as well as my various other ventures over the years. My new MIDI recording of Cog-Dance is now complete and live. I’ve updated the blurb on the page for good measure. What I now regard as my definitive Trumpet Concerto (originally for trumpet and brass band) is complete and here for you to read about and enjoy. The finale got quite groovy in the end with some prog-rock-ish stuff in 11/16, and makes full use of the bass guitar and drumkit I treated myself to in the orchestra. My own Kapadokya , which was developed from one of the tunes I originally wrote for The Europeans back in 1995, has developed somewhat and is now an established part of our repertoire. This is, as far as I know, the first non-Ramsing composition Psychoyogi has ever played! Our support set at Iklectik Art Lab in Lambeth, our first appearance there, on Friday 8 March went fine for the eight or so people present, as did our Biddle Bros. gig on 15 March. Next gig lined up isn’t until 8 June at... yes, Biddle Bros. The ‘live’ videos of four of our songs have been well received and appreciated. These were not in front of an audience, hence my scare-quotes, but we did play and record in real time — it was all done in our (former?) drummer Jonas Golland’s bedroom! It was good fun, if a little tricky to negotiate the stands for three mics, three cameras and three lights in a very confined space — but we managed. They’re all on YouTube: Therapy Session , The Magic Tellingbone , Happy Family and Evening Call . The album Shrine is still available to download and listen to on iTunes, Spotify and Amazon (among others?). My new(ish) MIDI mix of Double Entendre , using the much better brass and piano sounds now at my disposal, is done. Although these sounds are far superior to those I used before, I had to make a few compromises due to the lack of some of the proper brass band instruments, mainly the horns in the middle (tenor, baritone, euphonium), but it seems to have worked out well — it’s certainly a vast improvement on the previous recording, so I’ve added it to YouTube and SoundCloud. Full technical details are available on the Double Entendre page. I’ve revisited 60 Minims and made a new realisation of it (the original audio being lost). 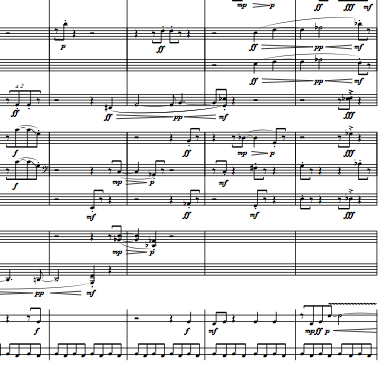 The final movement (but first to be composed) of my new chamber orchestra work Hall of Mirrors is now complete, along with my usual MIDI recording. I redid my page on The Europeans , complete with some of the music (by no means all of the pieces) for your listening and dining pleasure. Apart from Psychoyogi it was my main musical activity for a while, until I got back down to Hall of Mirrors (see above). There’s a new(ish) page on the site, for the benefit of composers struggling to keep track of their harp pedal settings. Very niche, I know, but it could well be handy for some folks. And yes, I’m well aware that it doesn’t work too well on various types of touch-screen and mobile device, but I’m afraid I can’t dedicate the rest of my life to catering for whatever kind of hybrid device the industry thinks up next! I found this page immensely useful while working on the harp part of Hall of Mirrors . Original The Bebop Variations for brass trio recorded with MIDI — listen here. New scores of the original Trumpet Concerto and — possibly my strangest work — in heaven... to replace old handwritten versions. PDF extracts available to download. Original 1974 recording of Formative Years now available for listening to here, on YouTube and on SoundCloud. Real human musicians! Some of them now jazz luminaries. 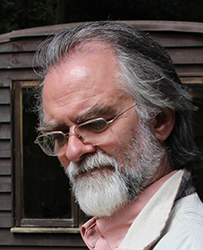 Apart from all that, naturally, this web site: explore my works, read my biography, keep track of your harp pedal settings, and see what’s on the various other pages. You can also get in touch with me via the Contact form. And for those with a taste for historical technical curiosities, there’s even a page about my NotaFile document — and the document itself. As well as listening to my MIDI recordings on this site, you can visit my channels on YouTube and SoundCloud to hear the same MIDI realizations of eight of my works, and see the same YouTube videos as you can see here, to get a glimpse of the scores (in most cases). These pieces are available: Hall of Mirrors V , Bebop , lovesongs , The Bossa Nova Variations , Return of the Son of the Bebop Variations , Variations on a Theme of George Harrison , Music for an Imaginary Ballet , Five Pieces for Saxophone Quartet and a little musical joke called Porterstraum . Also on the Listen page is my standard disclaimer about MIDI recordings, and a note about browser compatibility with the players for YouTube, SoundCloud and plain MP3s embedded in these pages. And in case anyone’s wondering, what I’m actually looking at in that photo is not the score of Short Change , but a large owl perched on my wrist.